Kristin Crump and her two kids put damp cloths over their mouths on Thursday for the short walk from their suburban Houston front door to their car, defying an order to remain inside because of dangerous fumes coming from burned-out petrochemical tanks a couple of miles away. For the second time in three days, they were heading to a relative's house, worried about what they've been breathing since a massive fire broke out Sunday at the Intercontinental Terminals Company in Deer Park and not believing officials' assurances that they were safe. "I do not fully trust what they say," said Crump, whose husband later met up with her and the kids, who are 6 and 13 years old. "I do believe what is in the air is very harmful and it can have long-term effects such as cancer and things like that later down the line. I don't think it's worth risking that for me or my kids to stay there and breathe in this stuff." Authorities lifted Thursday's order to remain indoors after several hours, saying tests showed the elevated levels of benzene in the air had cleared. But that was little solace to residents who watched for three days as a giant plume of black smoke billowed from the plant, leading authorities to close neighborhoods and cancel classes at area schools. "It's pretty harrowing," said Jeff Fountain, a chemist who lives with his wife and three children about four miles (6.4 kilometers) from the plant. "I work with benzene ... science has told us that it's a well-known carcinogen," he said Thursday, adding, "The plume is gone, but the benzene is in the air is lingering." On Wednesday, when authorities said they had finally extinguished the blaze, Deer Park resident Terri Garcia expressed her own concerns. "Everything has been wrapped up in this nice perfect bow in saying that there were no problems," she said. "Every air quality was perfect. Every wind was perfect blowing it away. And if everything was so perfect, why did it happen?" Several government agencies will continue to monitor the air around the plant, where the tanks that caught fire contained components of gasoline and materials used in nail polish remover, glues and paint thinner. ITC said 11 of the 15 storage tanks in the area where the fire occurred were damaged. Authorities haven't revealed the cause of the blaze. They said Wednesday that the benzene levels near the facility didn't pose a health concern, but they issued the shelter-in-place order early Thursday due to "reports of benzene or other volatile organic compounds" in Deer Park, which is about 15 miles (24 kilometers) southeast of Houston. Harris County Judge Lina Hidalgo, who is the county's top administrator, said at a news conference that light winds had helped keep the vapors from spreading more broadly. Dr. Umair Shah, who heads the county health agency, said there was only a minimal public health risk, but he cautioned that the elderly, pregnant women and other vulnerable groups should take precautions. "The most important thing is that the levels that have been detected are still not high enough for the level of concern that people may be having," he said. 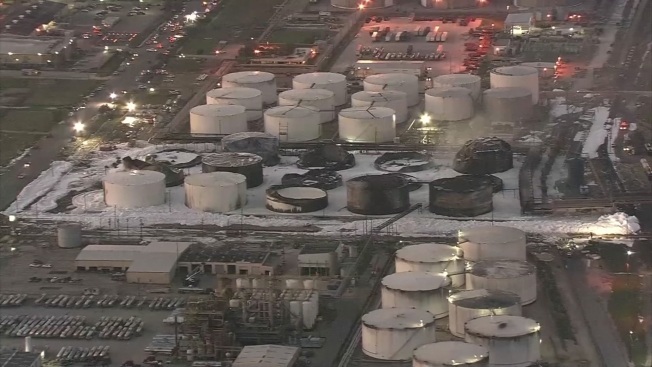 Intercontinental Terminals Company spokeswoman Alice Richardson said Thursday company officials believe winds shifted foam that had been sprayed over one of the tanks which burned in the fire, allowing benzene vapors to escape. The Texas National Guard's 6th civil support team was assisting at the scene Thursday. The team of about a dozen was helping to contain hazardous materials and provide other assistance to local emergency responders. Environmental groups said people who live near the facility have experienced various symptoms, including headaches, nausea and nose bleeds. According to the Centers for Disease Control and Prevention, long-term exposure to the highly flammable chemical causes harmful effects on the blood, including bone marrow. Crump said her family left town on Tuesday because her kids were complaining of headaches. They returned Wednesday, only to leave again Thursday. The Environmental Protection Agency conducted air quality tests throughout the Houston area, both on the ground and from a small airplane, and "measured no levels of hazardous concentrations," EPA official Adam Adams said Wednesday, hours before officials had imposed the shelter-in-place order early Thursday. Bryan Parras, an organizer in Houston with the Sierra Club, said his environmental group had concerns not just about the air quality, but about the potential impacts to the environment and the fishing industry if chemicals from the storage facility or firefighting foam get into the Houston Ship Channel, which leads to the Gulf of Mexico. "This issue isn't over just because the fire is out. We want systems in place that will protect our communities," Parras said Wednesday. The EPA and the Texas Commission on Environmental Quality said Wednesday that they were waiting for test results of water samples to determine any potential impacts from the foam used to fight the fire on waterways next to the storage facility, including the Houston Ship Channel.